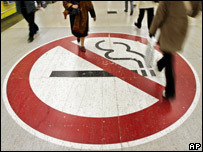 The ban on smoking in enclosed public places comes into effect on the morning of Sunday 26 March. As part of the series of articles from interested parties supporting and opposed to the ban, Paul Waterson, chief executive of The Scottish Licensed Trade Association (SLTA), warns that businesses will close. Mr Waterson is angered by how the ban has been brought in and what it will mean for members who will face having to police it. The Scottish Licensed Trade Association has vigorously opposed the imminent smoking ban from the start. We believe that customers should have a choice of places in which to smoke -providing that their habit does not disturb others - and that simple but effective ventilation or smoking rooms would very adequately protect staff from any dangers posed by the smoke. We also believe, that the ban has been brought in with unnecessary haste. This will damage our industry far more than if it had been brought in with proper consultation over a reasonable time frame. Time would have permitted us to educate and prepare our customers and businesses properly and for the government to encourage more people to quit. This undue haste has also caused confusion on compliance and enforcement from local authorities. Unfortunately, our concerns have been ignored. 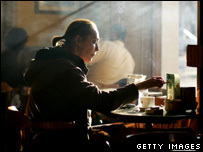 Pub owners are now responsible for reducing the amount that people smoke, even though the evidence from Ireland and Norway shows that bans actually have no effect on the number of people who smoke - only where they smoke. To understand how best to adapt to a ban we have looked closely at the pub industry in Ireland. It is clear that operators who adapted first did best and this meant creating comfortable outdoor areas. Their regulations were pretty clear - shelters with a roof may have a maximum of half the wall space enclosed. Consequently the licensed trade has been willing and able to invest large sums of money to keep their smoking customers happy. The story here is different. In practical terms licensees in Scotland have been given less than a month to organise shelters outside for their core customer base - the smokers. This may seem simple, but when you consider that planning permission takes eight weeks and licensing changes can take months, before even considering the cost of and physically installing canopies and heaters etc., four weeks becomes a tight if not impossible schedule. Add to this the fact that every local authority we have spoken to has a different idea about what is and isn't allowed as a smoking shelter - including 'if it has a roof of any description, you can't smoke under it' - and you'll quickly understand that following the letter of the law is not as straightforward as it first appears. A lot has been written and said about the Irish experience. Health groups think that it has been an unqualified success. Many people in our industry know that this success has come at a price - and that we as an industry will be forced to pay that price here too. Without doubt there will be pub closures and job losses - this is the price to our industry, but more widely the law allows local authorities to ban smoking in other places like local parks and several are considering doing just this. We are not obsessed by personal freedoms, particularly those that are unpleasant for some people, such as smoking. But we are concerned that limits on how people use what is in fact a legal product have been crossed and could open the floodgates for controls on other legal pastimes - drinking, eating, freedom of speech.